The Nivea ad for men has been quite the buzz in the past 24 hours. I’ve shared my thoughts all over the net but I’m curious to know what your take is on it. 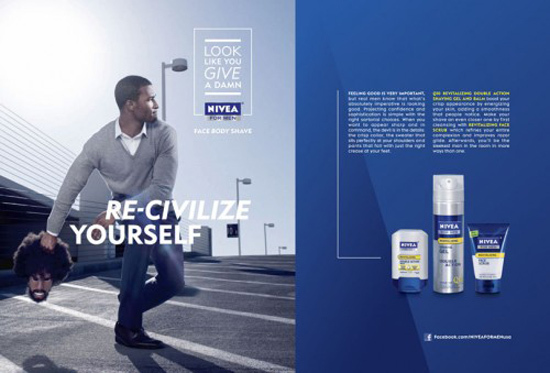 In the above ad, the black man is throwing his own head which is an unruly afro and beard, portraying to the black male demographic to “Re-Civilize Yourself”. (Note: The caucasian ad doesn’t say re-civilize) so what’s going on here? To be honest, I don’t even use Nivea products because they dry my skin out, however, this campaign comes off as very offensive to those who wear their hair natural or like to have beards. Then again, I am not surprised by these ad agencies trying to capture the minority demographic but I do suggest they add more diversity to their team cause this should’ve never slipped through the board room. What do you guys think about the Nivea ad? Is it too much? or are we (people of color) too much into it? This is a hot mess, where do these advertising agencies get off thinking they know what is “civilized”?